Today is the 58th edition of our periodic guest post series called 10 Questions and a Pizza Place. (The 1500′s are pizza fanatics.) We have a list of 17 questions we pose to fellow financial bloggers, and they are free to pick and choose 10 or answer all of them. Let us know if you would like to be featured in a future edition of 10 Questions. This is the last edition featuring our old questions and I can’t think of a better way to end them than with James Collins from jlcollinsnh.com. Mr. Collins writes some pretty great stuff, but he is most known for his excellent stock series. Confession: I have come to believe that index funds should be the core of any healthy portfolio, but before I started blogging, I barely knew what an index fund was. I’m a pretty stubborn guy, but Mr. Collins’ stock series convinced me to abandon my stock picking ways in favor of Vanguard index funds. I’m in the process of moving it all to Vanguard. Thanks Jim! come up with a pretty awesome list of quotes. And really, I’m just at the tip of the iceberg. However, I’ll stop talking now and turn things over to Mr. Collins. If you have to ask, you wouldn’t understand. Thinking I, or anybody, could pick individual stocks successfully over time. Yes, I know Warren Buffett has. That’s why he’s famous. I can’t get in the ring with Mike Tyson either. If you think you can, let me know and I’ll sell the tickets. It would go into VTSAX and I would spend the ~4% sustainable annual withdrawal rate. This is how to think about money: Not as what it can buy, but how what it earns can provide for you forever. Oh, and were I younger, I’d reinvest rather than spend the earnings. I haven’t had a car since ~2002 when I last had a job I needed to commute to. It was a Honda Accord. Now when I need one, I borrow my wife’s. She drives a 2014 Mazda 3 Hatchback we bought in late 2013. We passed her 2007 Subaru Forester on to our daughter. We loved that car. This summer our daughter is likely going into the Peace Corp or to Europe to live. Either way, the Subaru will come back to us. It will be interesting to see which one we keep. The Mazda is newer and great fun to drive. The Subaru holds more and older cars have the advantage of being less of a worry when some yahoo in a parking lot throws open their door into your fender. And, of course, in the better weather I have the Triumph. Mr. 1500 note: Mr. Collins is referring to his motorcycle here. Once, he had an awful car that was anything but a triumph to own, despite the name. Jack Bogle. A great man and not just on the financial stuff. The more I read about and from him, the more impressed I become. Think of it as spending. What you are buying with it is your freedom. Slowly she unbuttoned her blouse…. Too many to list. But the movie I’ve seen the most frequently is, hands down, The Lion King. It came out when my daughter was about 3 and prone to become obsessed with a specific movie. I’ve watched it with her at least 100 times. Fortunately, it’s a pretty good movie. The Mad Fientist is a financial blogger who does some travel posts. Go Curry Cracker is a travel blogger who does some financial posts. Both make me sit up and take notice when they post. Both have introduced me to new concepts or new takes on old ones. When you’ve been knocking around this stuff as long as I have, that’s no small thing. Can I Retire Yet? gets high marks for clear, detailed explanations on how this financial stuff works. Both, but I admire cats for their independence and ease of maintenance. Unfortunately, I’ve developed allergies to both. Jake is our now 12-year-old hypoallergenic miniature Poodle. About 17 lbs and a foot at the shoulder, the perfect size in my view. I resisted getting a Poodle for all the standard reasons. Now I wonder that anyone chooses any other breed. Wicked smart and great disposition. Equally at home roaming through the woods with me or having my daughter dress him up in baby clothes. Exceedingly handsome, as long as you avoid giving them goofy haircuts. Overall: Taking on debt. Doing so is pledging yourself to a life of slavery. I put myself through college taking down trees that were being ravaged by Dutch Elm Disease. I was young, fit and strong and the work was physically hard, outdoors and dangerous. It also brought me into contact with and taught me how to deal with people very different than I. This will be very useful should I ever go to prison. What would you do with a billion dollars. And a time machine? ….back in 1997 I would have bought Sue. She went for only $8,362,500. after all. Then I would have bought a mansion with an entry hall large enough to display her and the Field Museum would have been out of luck. I hope you enjoyed this because next month, I’ll be featuring an epic 3 part series with Mr. Collins. In the meantime, show him some love over at jlcollinsnh.com. This is the kind of fantastic writing that gets me hooked, thanks for doing this one – Mr. Collins’ blog is the latest rabbit hole I have crawled down. Can’t wait for the 3 part series! I try to make my stuff entertaining as well as useful, so that’s high praise indeed! Two of my favorites in one article/post! Great Uncle Jim just might be The Godfather of financial independence blogging. Nice job,fellas. Great Uncle Jim, The Godfather of financial independence blogging has a nice ring to it. Other than making me sound (as I am) old. Oh, and you meant, “Nice job, Good-fellas,” right? Jim is the man. He’s the guy who turned me on to index funds and simplified investing. Between him and MMM, we had the foundation we needed. What would your net worth have been today if you had been indexing instead of stock picking? I’m sure there were a lot of folks who did really well with Blackberry or RIM. I have no clue how my fickle tech stocks will be doing in 10 years. Way too much risk to hold on to long term. You made some really good calls on those stock – congratulations! My thinking is similar; also it may not be good to leave individual stocks to heirs as they may not know how to manage them. Upon your death the cost basis of those shares is adjusted to the price at the time. Your heirs start fresh and the potential capital gains tax on the appreciation during your lifetime is avoided. Very interesting! I didn’t know that. I wonder if it the same in all countries? Truth is I hit FI while I was still picking stocks and fund managers. So there is money to be made doing it. The problem is, that as exhilarating as the winners are (and boy howdy they are exhilarating!) inevitably you have losers in the mix. Looking at them together, you might be making money (I was) but not as much as with simple old VTSAX. The sad truth is, it took me a long time to come to indexing. I spent decades making all the same arguments against it I hear made today. This might be why I’m a little impatient with them: They remind me of my own stubbornness and it saddens me to see people making my mistake. Looking back over time, my best guess is, with compounding, my net worth today would be ~50% higher had I started indexing near the beginning. By the way, it really impresses me that Mr. 1500 has done so well with his stocks and yet is still able to see the flaws in being a stock-picker v. indexing. That takes an amazing amount of self awareness and perception. Certainly more than I would have had. 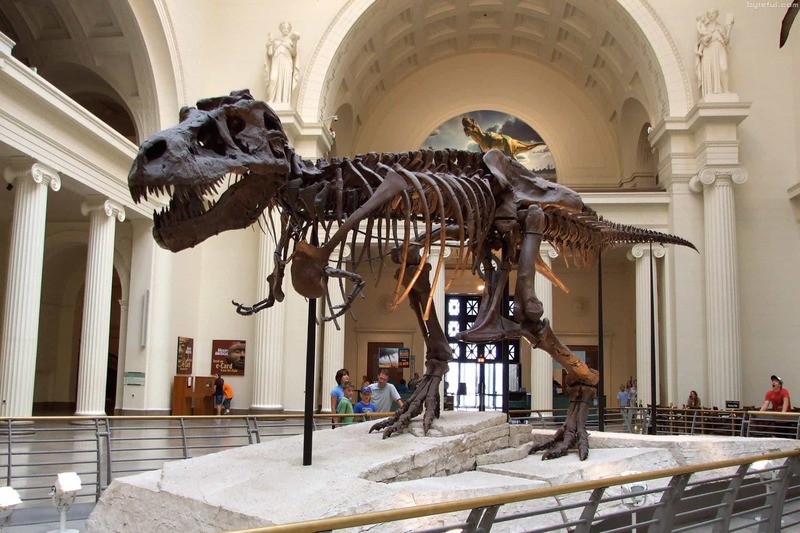 The American Museum was actively engaged in the bidding for Sue back in the day. Seems nobody expected her to sell for so much and so they hadn’t raised enough funds. I was amazed that she sold for so little! I mean, Sue is the largest and most complete T-Rex ever found. Talk about one of a kind! No more stock picking 1500’s? It’s interesting, how many personal finance bloggers haven’t read the boglehead investing book? Just say maybe. right now, almost half of our portfolio is in stocks. I’d be OK with it being less than 20%. My ideas are few and far between as well: Google (2004), Apple (2007), facebook (2012) and Lending Club (2014). So, I hardly ever buy stocks to begin with. I’m fortunate that ones I’ve bought have done well, but that creates another problem in that they’re taking over my portfolio. It is so absolutely true that when you save money what you are actually doing is “spending” the money to buy your freedom. Once I fully grasped that concept, refraining from a frivolous expenditure and banking the money instead never felt like a sacrifice ever again. As financial “tips” go, that one is truly priceless. At the first Chautauqua I was having a conversation with the wife of one of the attendees. Her husband was enthusiastic about this stuff and she was trying to get on board. But she had been raised in a wealth family and grew up spending money with no concerns. The feeling of not shopping was like not breathing to her. Somehow that idea that saving and investing is a form of spending just hit me. I expressed to her and her eyes lit up. It was a way she could comfortably look at the concept. The reaction was so powerful I decided to add it to my presentation the next morning. Again this angle on the concept seemed to deeply resonate. I’ve used it ever since. Glad to hear it resonates with you as well. Great interview 1500 (but sad this is the last one!) – and thanks for putting J Collins back on my radar – I spent many months absorbing all his posts some time ago, and am well overdue for a return visit! Jason@Islands of Investing recently posted…A great investment – but a bad decision? Not really frustrating as I’m not really interested in persuading anyone. It’s more embarrassing. It holds a mirror up and reminds me of a mistake I made for far too long: Long after I’d come across the data to know better. I too bought too many different stocks. I wish I would have been a Boglehead much earlier. I was a index fund guy in the early 90s, but when the internet stocks were headed up, I fell for the speculation. No Nonsense Landlord recently posted…Are you getting Your Landlord Discounts (also homeowners)? That was the last really expensive mistake I made. The good news is it burned away the last of my doubts. Mr.1500 can’t wait to see new series. This is my favorite answer of all time. I have a similar outlook, but the only tweak is that I remind myself that every dollar I use for consumption instead of saving/investing is really worth 5 times as much to my future self in 20 years. Because if you assume a 8% growth rate it gets you pretty close to 5X. It makes it pretty easy to make purchase decisions. The item may be $1,000 today, but would I be willing to spend $5,000 (and thus steal $4,000 from my future self)? I have read your site off and on over the past few months ( depending on my time availability). I was curious if you had taken the time to research why your picks didn’t do as well? Were you making large bets on single securities, or were you chasing hot tips (or maybe doing something else)? I am also curious, would there ever be time when index funds are not worth purchasing? I am also curious, do you think there would be time at which index funds would not be good investment ideas? In other words, how do you know when your strategy is not working – what would cause you to abandon indexing. I wish you good luck in your investing journey! I spent decades fooling with individual stocks and if there is a mistake that can be made that I missed, well, it’s only ’cause I missed it. Each focused on one, maybe two industries and perhaps 6-10 stocks. They lived and breathed these few companies. They knew each inside and out. They knew the top executives. They knew the middle-managers and the front line people. They knew the customers. They knew the suppliers. They knew the cute receptionists. They open access. They spoke to them all weekly. Sometimes daily. They had every resource available. They issued reports our institutional investor clients paid dearly for. And yet, predicting stock performance remained frustratingly elusive. Index funds are a brilliant match to how the markets actually work and have been well proven over 40 years of hype-active challenges (after all, Wall Street makes huge money on active management and individual stock pickers). Good luck in your journeys as well! jlcollinsnh recently posted…YNAB: Best Place to Work Ever?